Long-time readers will know that Burt’s Bees make my absolute holy grail lip balm. I could release a full-length album with all the praises I’ve sung for these little tubes – just a few examples here, here and here. 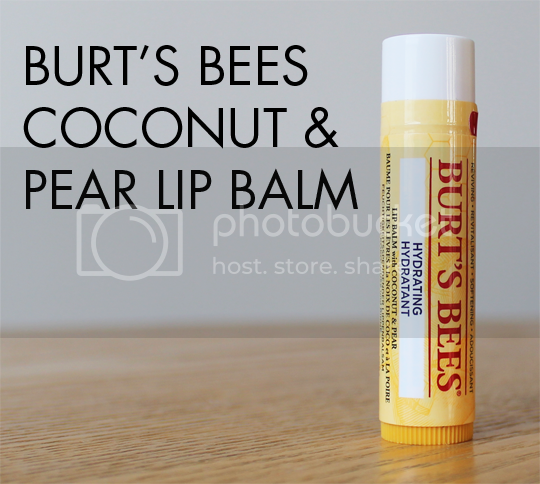 The newest member of the family is this Burt’s Bees Coconut & Pear Lip Balm*. Burt’s Bees Coconut & Pear Lip Balm is exactly what it sounds like – a nourishing, hydrating beeswax based lip balm enriched with coconut oil, pear extract and shea butter. These elements combine to create a gorgeous tropical scent and flavour that may well be one of the best lip balm creations Burt’s Bees have ever come up with. I have Burt’s Bees Lip Balms all over the place, seriously. On my bedside table, on the coffee table, in all my bags and coat pockets, in my desk drawers at work, on my dressing table, you name it. This new Coconut & Pear version comes highly recommended, along with my other favourites Blueberry & Dark Chocolate, Honey, and my holy grail Pomegranate. Burt’s Bees Lip Balms retail for £3.69 and you can buy them online. If you get lucky, you might find them in store at Waitose, John Lewis and some larger Boots stores. Burt’s Bees for Mothers’ Day, and Monsoon for Burt’s Bees!